Here we present an in-depth comparison between the Red Wing Heritage Blacksmith and it’s more rugged brother the Iron Ranger boot. From construction to color options hopefully this guide will allow you to choose the best Red Wing boot based on your needs and preferred style. The Red Wing Iron Ranger and Blacksmith boot models have near identical construction. Both styles are made with a Goodyear Welt construction and feature a leather insole and steel shank. Both boots are also made of high quality S.B. Foot Tanning Co. leather. When it comes differences in the leather, each model offers slightly different color options (more on that below) but the quality of the materials used is the same. The biggest notable differences between the Blacksmith and the Iron Ranger are seen on the outside of the boot. The first thing you’ll notice is that the Iron Ranger features a “cap toe” while the Blacksmith features a more traditional “round toe”. You’ll also notice some differences in the leather paneling on the uppers especially around the back of the boot. Above the heel the leather on the Iron Ranger “wraps” around to the side of the boot while the Blacksmith features a single piece of leather that runs parallel on the heel. The Red Wing Blacksmith and Iron Ranger are just about the same in terms of sizing and fit. Red Wing suggests you go a half size smaller than your regular shoe size for both models. Both boot styles are also built on Red Wing’s Last No. 8 that is used on many of their signature Heritage round toe boots such as the Blacksmith and Iron Ranger. Here you’ll see the more bulbous “bump” toe that allows for more toe wiggle room up front. Last No. 8 is one of Red Wing’s oldest and most frequently used lasts. Recently Red Wing introduced the Vibram 430 Mini-lug outsoles to many of their models. Current Red Wing Blacksmith’s are made with the Vibram 430 Mini-lug outsoles while the Iron Ranger gives you the option to go with the traditional Nitrile Cork outsole or the newer Vibram 403 Mini-lug. Above is Red Wing’s Nitrile Cork outsoles with the newer Vibram 430 Mini-lug by it’s side for comparison. The main difference between the two is grip and traction. The Vibram 430 Mini-lug allows for better traction in snow and other wet conditions. The Nitrile Cork outsoles will get slippery if the ground is wet and is better suited to be worn in dry climates. This is an important distinction for those who get snow and rain during colder months. You can expect to choose between a few different leather color options with the Red Wing Blacksmith. Briar Oil Slick, Copper Rough and Tough and Black Spitfire are the most common Blacksmith leather stains. Red Wing offers many more color options with their Iron Ranger model. Their Hawthorn Muleskinner Iron Ranger model even offers a nice light suede option. Leather colors vary from the Vibram Mini-Lug models and Cork Nitrate sole models but in total you have over 8 different leather stains to choose from. Red Wing Iron Ranger offers many more color options as well as suede options. 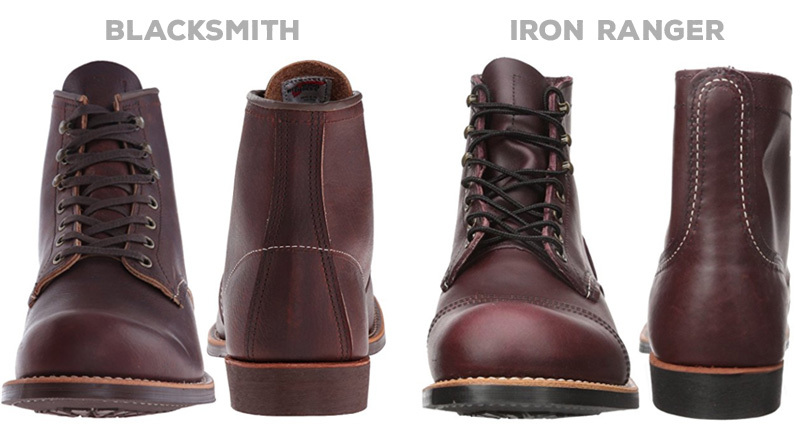 Both the Red Wing Blacksmith and the Iron Ranger are very similar when it comes to fit, materials and construction. With so many similarities it’s safe to say that the differences really lie in personal preference. The Red Wing Iron Ranger is a classic heritage boot with a distinct work boot style. The cap toe and round laces gives it a bold look that is better suited for casual styles. If you are planning to wear your Iron Rangers in rain or snow then consider the Vibram Mini-lug over the Nitrile Cork outsoles. The Blacksmith on the other hand is slightly more “dressy” thanks to it’s flat laces, sleek profile and round toe. Although the Blacksmith is casual in nature, it is dressier than it’s rugged older brother the Iron Ranger. Because of it’s Vibram soles and rough S.B. Foot Tanning leather the Blacksmith would still be considered a casual boot at heart. These all white boots for men will keep you looking fresh all season long.